. . . So What’s the Matter with the Way I Look? magazine in New York. 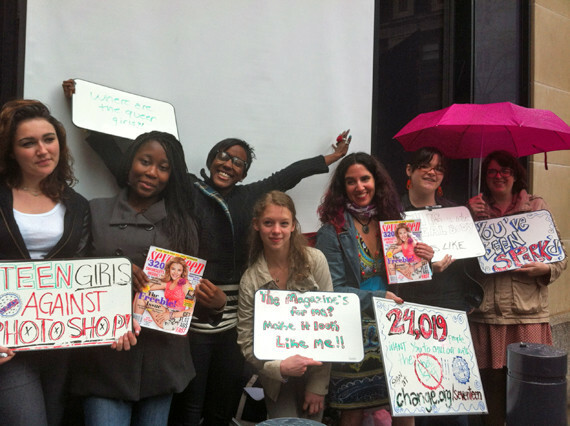 These young women were holding up signs calling for a more realistic representation of readers, with slogans ranging from “teen girls against photoshop,” “The magazine’s for me? Make it look like me!,” and “This is what a real body looks like,” among others. As a part of the SPARK Movement, they are taking action to make the world a safer, more positive place for both girls and women to thrive. The SPARK (Sexualization Protest: Action, Resistance, Knowledge) Movement is for girls, to push back against sexualized imagery of girlhood, and it’s a movement by girls. Sexualized imagery of young women can be harmful to the self-esteem of the girls who view it, as it limits who can be seen as beautiful by mainstream society and turns girls’ and women’s bodies into a tool of marketing, and the effects it has on the self-esteem of girls can be lasting into adulthood. Instead, SPARK promotes the right to healthy sexuality, which allows intimacy and is connected to more positive feelings as it doesn’t leave room for harmful objectification. The SPARK team is comprised of girls and young women, ranging from ages 14-22, that came out of a summit in New York where young women came to speak out against the sexualization of girls in media. This summit also gave these young women the tools and information to become activists, organizers, policy influencers, and media makers. Their goal is to encourage girls to become active participants as part of the solution to taking down the increased sexualization of girls and young women in the media. One of the campaigns that SPARK has taken on has been one against photoshopped images of models’ bodies faces, especially in magazines such as Seventeen and Teen Vogue, which are aimed at teen girls. These images, which go through extensive retouching, can have very detrimental effects to the self-esteem and well-being of girls, because it shows a distorted and very limited view of what is beautiful. As a part of their greater goal, the SPARK team started petitioning to Seventeen to get the magazine to stop publishing photos of models whose bodies and faces have been photoshopped. Their online petition gathered 84,000 signatures, and some of the SPARK bloggers personally delivered these signatures to the headquarters of Seventeen located in New York, the same day where they later staged the mock photo shoot and protest. The SPARK team was able to meet with Ann Shoket, the editor-in-chief of Seventeen, to discuss with them how airbrushing models’ bodies and faces is harmful to their readership. After this meeting, SPARK continued to petition against the use of Photoshop in the magazine..
A few months later in her Editor’s Letter, Shoket introduced the Body Peace Treaty, composed by her and other editors of the publication, to celebrate and promote girls of all shapes, sizes, and color. In addition, the magazine made a commitment to featuring a diverse range of models which would be more reflective of their diverse readership. In working together within their own group as well as part of the coalition which SPARK has helped create towards this common goal, these young women have made their voices heard and were successful in their endeavors. Amy Campbell: Thank you for taking the time out to talk with me! Okay, first question: How did you first get involved with SPARK? Crystal Ogar: My pleasure! Well actually, I found out about SPARK through Tumblr, I did a search for feminist blogs and SPARK came up! I was lucky enough to start chatting with one of the girls who was involved with SPARK and she suggested that I apply! AC: This is one of the big reasons I like Tumblr, it’s definitely given me a chance to make some pretty cool connections (like yourself!). What was it like working intergenerationally with both girls and women? CO: Same here! I’ve definitely made some awesome friends and learned so much through Tumblr, it’s pretty great! It’s amazing being able to work with women and girls of all different ages. With all of our combined life experiences and being at different places in our lives really helps with the issues we talk about and they are some of the best people I’ve ever met. So supportive and helpful. AC: I would like to ask you particularly about the Seventeen campaign, as I’ve read many articles about it, but before we talk about that, what other projects have you worked on with SPARK, and which one did you enjoy the most? CO: I think one of the most exciting projects I was able to be involved with was of course being invited to speak at Women in the World at the Lincoln Center in NY. I was in the company of the most wonderful women who were doing so much to change the world around them, and I was humbled to be apart of it. AC: I remember reading about that, it looked really awesome and exciting! With the Seventeen campaign, in reading a lot of the articles, I got a limited view of SPARK’s experience in the project, and I am really interested to hear what you have to say about your experience with it. CO: It definitely was! And yeah, it seems like a lot of the articles left out SPARK which is silly because we all did it. So SPARK started the petition on change.org asking Seventeen to stop photoshopping their models and actually stick to the “message” that their magazine is supposed to give, that you’re fine the way you are. Julia’s [Bluhm] an activist with SPARK of course and she was one of many who worked on the national campaign. The day that she and Dana Edell (the executive director) spoke to 17, I took a train to NY from MD and met up with several other SPARK girls (Emma, Kaye, Julia) at the Change.org office where Shelby Knox works, (a professional feminist who also works with SPARK) and the Nightline news team were filming us as we prepared to have a mock fashion show outside of Seventeen’s headquarters. CO: We went through issues of Seventeen and “SPARK’d” them, which means we put post-its with encouraging messages and questions about specific aspects of the magazines. 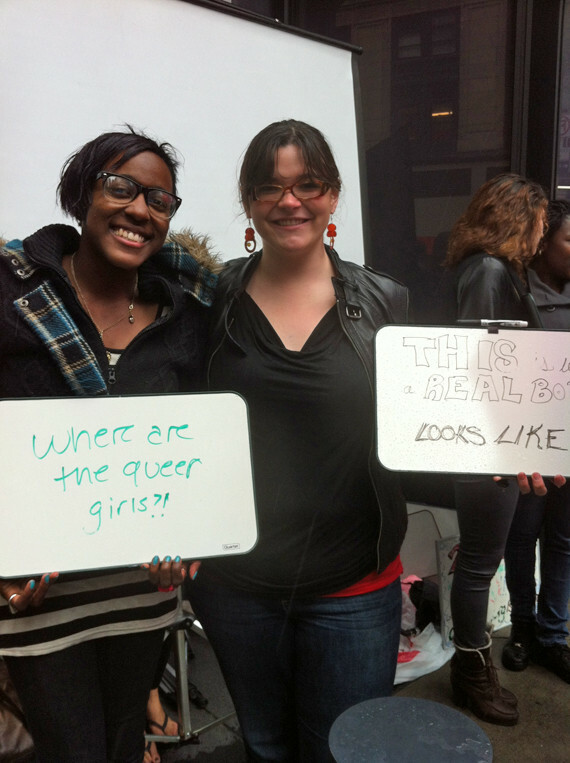 It was a rainy day, but we all had so much fun holding up our signs asking “where are the queer girls?” “where are the disabled girls,” and so on. CO: There were tons of reporters taking our pictures and interviewing us and later in the day Julia and Dana were invited up to speak to Ann Shoket, who at first denied our claims and wouldn’t take any action. AC: Wow, I didn’t know that! Was that the only challenge you guys had to face? CO: In the long run, yes! Ann said that they don’t photoshop the models, yeah right, and basically lied about the fact and sent Julia on her way. CO: After all the pressure on Seventeen, we kept getting more and more signatures on the petition after they jilted us, and they finally came out with a statement saying they would never alter the bodies and faces of their models, with of course adding that “they didn’t do that anyway.” Again, yeah right. AC: Of course. What project(s) are you currently working on? CO: Well I’m interning for the film Girl Model, which is a really interesting and sad documentary about the modeling industry and how it’s basically a trafficking scheme. And there’s a new fashion app called KeeKaa that I’ve been working with whose focus is that fashion is for everyone, and the app is about building a community where you can discuss your fashion with your friends and other people who are interested! AC: That sounds really exciting! I’m definitely going to have to check it out. Are you still involved with SPARK as well? CO: Yes, please do! I’ve sort of aged out of SPARK, but I still work with them on projects and things! And mentor, kind of like a big sister deal. AC: Cool! How would someone go about getting involved with SPARK? CO: We usually have an application drive sometime in the summer I believe, but I’m not 100% sure, but when I find out I’ll be sure to let you know! AC: Definitely. Thank you again for talking with me about SPARK! It’s definitely something that I think more people need to know about. CO: Of course Amy! Thanks so much for interviewing me! And we think so too. Want to get involved with/learn more about the SPARK Movement? Visit their website or contact them at SPARKsummit@gmail.com!